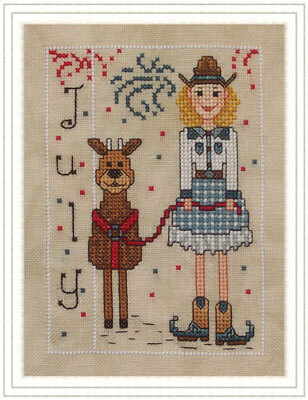 Miss July is Julie 'Ms. J' Jingles. Julie is a reindeer wrangler at Santa's premier stables. The reindeer voted her most valuable wrangler last year. She teaches the classes Frolicking with Friends to the little deer, Fundamentals of Flight to the yearlings and Smooth Rooftop Landings to the advanced flyers. Julie enjoys writing country and western Christmas carols and plays harmonica with the Outlawed Antlers at Tiny Tim's Saloon. She also coaches the yearling relay team for the reindeer games and is a guest announcer at the Polar Star Sleigh Pulls. Julie has a surprise talent that few know. She works behind the scenes designing the fireworks used in the Christmas Village celebrations throughout the year. Her carefully choreographed fireworks are the finest in the Northern Hemisphere. Julie's perfect date is a picnic followed by line dancing at the saloon. 28ct. 'Legacy' cashel linen (stitched 2 over 2) from Picture This Plus. Stitch count is 57 w x 79 h.
copyright © 2015 Whispered by the Wind, LLC.